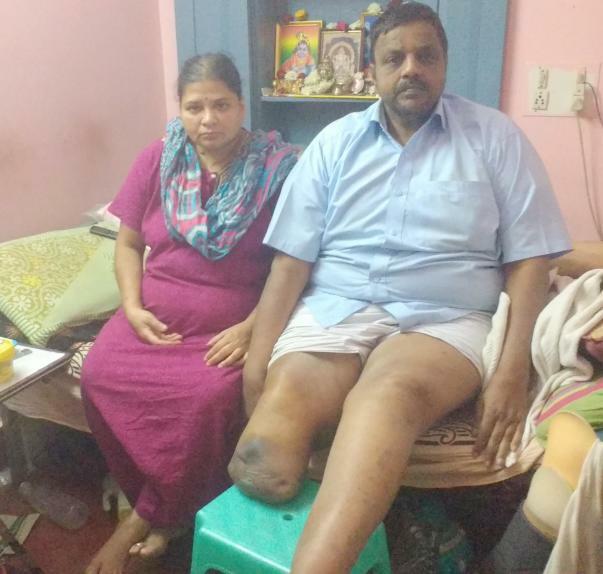 K Srinivasan, a 56-year-old national power lifter is now unfortunately powerless. He struggled hard during the 90s to represent Karnataka at the national power lifting championship and earn many laurels for the state. But hardly did he know that fate had stored something very harsh for him. In 2006, during his practice session at the gym, a 100 kg plate fell on his leg, which had to be amputated. Since 1985, Mr. Srinivasan had been practising; a normal day for him would look like- 2 hours of morning session at the gym, 8 hours of clerical job at a private company, and again 2 hours of evening practise session. He said, “Credit goes to my coach for inspiring me for this kind of sport”. 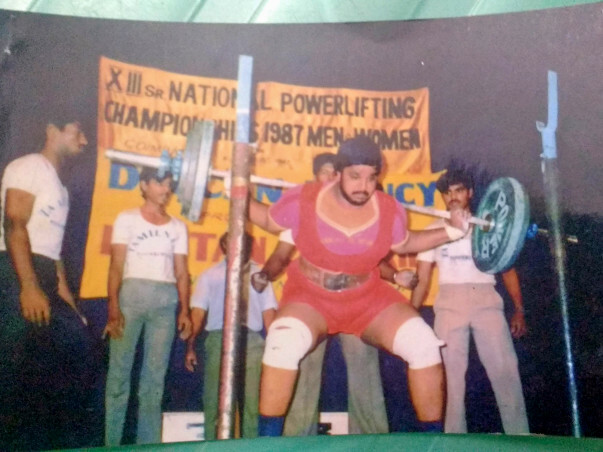 Srinivasan finally trained himself at the Mangalore Power Lifting Association. He was benchmark of strength. He represented Karnataka at the national level for almost 5 to 6 times and earned huge amount of success. He participated in the South India powerlifting competition at Hyderabad and secured first position. For almost a decade, he was associated actively with sports and powerlifting. It was barely anything for him to lift up a weight of 200 kilograms. He was also selected at the international powerlifting competition to represent India at Peru which he failed to participate due to lack of financial support. 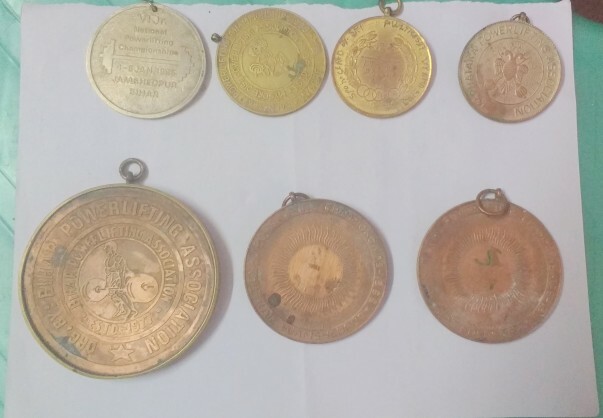 All the medals he won have rusted over time much like the memories people have of him. Things became unfavourable when he lost the job and his only source of income was powerlifting. Misfortune was at its zenith when a 100 kg plate fell on his right leg during a practise session in 2006. He had to rush to the hospital since the injury was drastic. 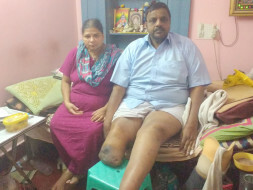 After a year, on 24th October 2007, his leg had to be amputated. In 2008, he organised to achieve Rs 50000 from the Chief Minister Relief Fund to get a prosthetic leg for himself. But that was not an end to his health problems. He had a serious pain in his left hand, spinal cord and also he was diagnosed with diabetes. Although doctors were successful in fitting the articial limb back in 2008, unfortunately it does not fit him anymore. With no form of physical exercise, his body weight increased gradually so as to not fit the artificial limb anymore. He presently weighs almost 140 kgs and finds really difficult to walk. The only ray of hope is to buy himself a new prosthetic leg. Mr Srinivasan said all his siblings have died due to either cardio vascular disease or diabetes. “I don’t get either financial or emotional support from anyone, other than my wife and daughter”, he said. Presently they stay in a rented house at Malleswaram and could not pay the rent for the last eight months. They have been asked to vacate the house at an earliest. Apart from him, his family has been also suffering through a lot of struggle. His wife has been diagnosed with a cervical spine problem along with diabetes. His daughter, who got married 9 months back, is also suffering from diabetics and is presently staying with them. “It is very depressing for me to sit back and do nothing for my family”, said Srinivasan. Mr. Srinivasan’s only income is a combination of physical disability pension and sports pension of Rs. 2700 per month. He needs 4.1 lakh to purchase a new prosthetic limb which is very urgent for him to run a normal daily life. Please donate and support him to fight this battle. This is Debotri, a fellow at Milaap. I have been speaking to Srinivasan for the last couple of days. He is extremely unwell and needs to be hospitalised as soon as possible. He is having fever and continuous vomiting. Apart from this, his wife is also not well. 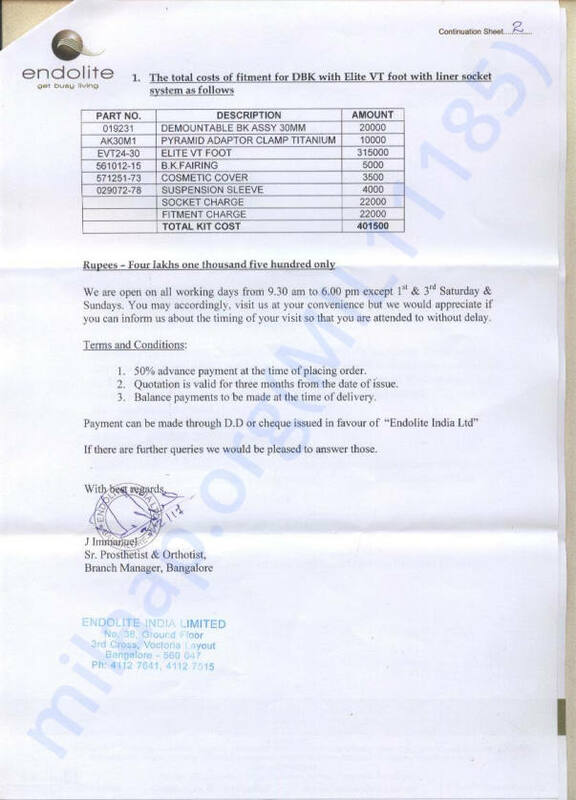 Srinivasan is finding really difficult to arrange funds for his treatment. Please support and contribute. Thank you once again. We will keep you posted. Here is an update regarding this campaign. 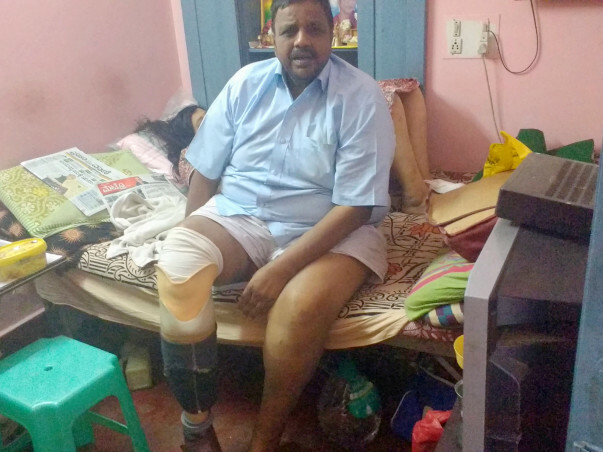 Due to lack of funds Srinivasan could not purchase a new prosthetic leg. Srinivasan has undergone a surgery to repair his leg for the time being. The surgery took place one month back. The funds were collected to get his leg repair surgery done. He is in a better state now. His wife is not keeping well and to support the family he is trying to start a catering business. He is thankful to all the donors for their amazing support and love.